BigCommerce is definitely e-commerce focused. The content side is a little underdeveloped, but the product functionality is one of the best I've worked with. If you have a website with a lot of custom product options, I would suggest BigCommerce product options, option sets, rules for those options, and the automatic SKU builder based on those rules and options are vital tools when building out the products. The ease of bulk editing (both in-browser and in through the export/import feature) means you can make changes to large groups of products quickly and efficiently, and you won't have to worry too much about incorrectly hashing your data. Simple Design. Using the template files provided, it is pretty simple to build an attractive and functional site with minimal coding. Our developers still needed to make a number of specific changes to the code, but much of that was due to this specific product. So I wouldn't say you could build the site without a coder, but if the product and design are simple, you shouldn't have to rely on a developer to create the site. Product Functions. The bulk import/export function is useful and not too finicky. I especially like the in-browser Bulk Edit function that is similar to a spreadsheet. (Unfortunately, this function is limited in the number of options, but it is still more convenient than exporting, editing, and then reimporting a .csv of products). Also, the product options, pricing rules, and facets are very useful. Ease of Updates. The back-end menus are pretty self-explanatory, and some options that are used more often are broken out to make them easier to update. The Home Page Carousel, for example, is nested right under Storefront, making it quick and easy to navigate to. This is convenient, especially when handing the reins over to users who are less familiar with site architecture. Better drill down of the reports & analytics feature. Better integration and clarity with the CRM (Customer Relations Management) section. More selection of HTML5/CSS3 Responsive templates. Analytics: the standard set isn't very robust, and they try to charge you for basic things like Sales by Item Category reporting. Checkout Page Customization: currently you need to know HTML/CSS to modify these, which isn't that user-friendly. Standard followup email customization: currently, you need to know HTML/CSS to modify these, which isn't that user-friendly. Phone support is great. Email support is terrible. Your support ticket gets dropped into a black hole, never getting any response. They have a comprehensive online help file system that makes it easy to do almost anything. They cover just about everything you'd want to do with your online store with images, clear descriptions and in some cases video. I will, however, say the videos should be a little more professorially done and not sound like the employees are doing it in their cubical. I prefer Adobe Business Catalyst to the open source competitors because they require a bit of upkeep to keep versions and plug-ins updated; BC does the versioning and updating for you. Besides Magento and some of the other enterprise-level ecommerce platforms, BigCommerce has the most functionality. Product Options/Facets, Pricing Tiers and Customer Groups, as well as an integrated blog make BigCommerce a great platform to build your website if you have a lot of custom products or variants of your products.When compared to the other enterprise-level ecommerce platforms, BigCommerce stood out because of the value. Many of the other platforms go directly to a revenue share model or don't offer the amount of features at lower price points. BigCommerce gives you a great number of options and abilities at its Standard, Plus, and Pro levels before jumping to a rev-share model in the highest level (enterprise). THis allows you to start smaller and work up to being in the Enterprise level, helpful when growing a business on a smaller budget. The CMS has been a great tool to use to close a deal. Assists those who do not have much experience with back end programing. The platform is far more secure because of their closed source code than platforms like wordpress or joomla. Everyone needs a website these days, and many of us need one that allows us to sell. BigCommerce helps me accomplish this. Unlike other online shopping carts, I simply pay a low monthly fee - no bandwidth charges, no fees per order - and I have a fully operational shopping cart that I am very happy with. As stated earlier - a direct built in Amazon connection (aside from the newly added Amazon Payments) would be an awesome addition. 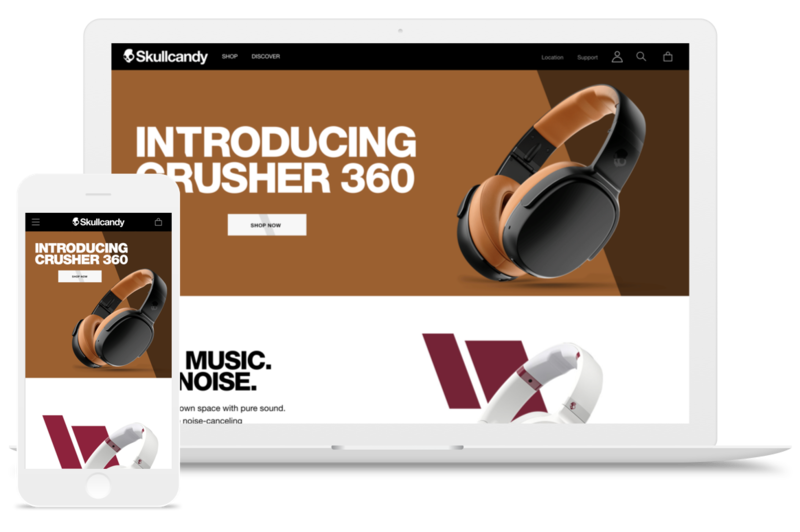 Enterprise ecommerce for high-volume brands like Skullcandy.